"Mommy, why don't you wear make-up?" My daughter asked me this today, and I wasn't too surprised as I guess you could say I've been in a period of time where I'm doing "good" for the day if I've gotten my shower in and I'm out of my workout clothes. I've never been one to wear much make-up, and as a matter of fact, the make-up I do own is in a caboodle that my mother got me when I was in high school and some of the eye shadows in it are, well... it's safe to say years old. As I watched my daughter carefully surveying my face, I had to wonder what ran through her mind. Maybe I looked differently than I had a few weeks ago. It's suffice to say I've earned the wrinkles that I've accumulated on my face and likewise, the bags under my eyes have grown significantly since I started having babies nearly 9 years ago. As I have 3 young daughters who study each and every one of moves, I want them to be able to look in a mirror and not demean themselves or pick apart their imperfections, because it's in those imperfections that some of our most unique beauty lies. 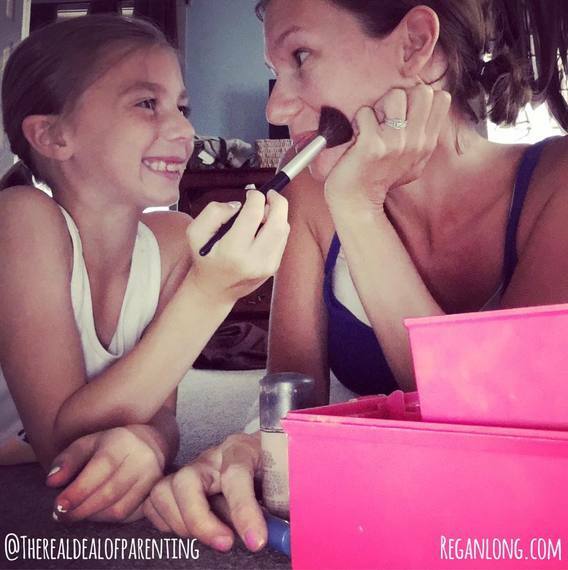 I want my daughters to take care of their skin and value their appearance, but I don't want them to compare themselves to others and feel they need to look a certain way because someone else does that they hold in high esteem. I want my daughters to grow into strong, independent, confident women who appreciate their natural beauty that God has already blessed them with, that no make-up could ever enhance. And likewise, I want my son to see women for their natural beauty that comes from the inside out, and that many times, is hidden behind layers of make-up that isn't even necessary. I want my children to learn that beauty may be determined in a number of other ways. Beautiful is a smiling woman. Beautiful is healthy. Beautiful is confidence. Beautiful is strong. Beautiful is energetic. Beautiful is uplifting. Beautiful is inspiring. Beautiful is resilient. Beautiful is in the way a woman carries herself. Beautiful is in the way she lets the trivial and unmindful pettiness unaffect her. Beautiful is in the way she understands the hard work it takes to have something, well... worth having. ....Beautiful is in the way a woman takes care of not only her family, but herself. Her emotional, spiritual and yes, physical, well-being. You see, my children aren't going to remember that their Mommy didn't have her face dolled up each day or maybe more than a little lip gloss thrown on for church or a special event. My children aren't going to remember how much I aged through their childhood years, nor will they know how my growing wrinkles may have somewhat bothered me more days than others. But I hope they remember that their Mommy handled aging with grace and dignity and a bit of humor, who always didn't take herself or her imperfections too seriously. I want my children to look back and recall that their Mommy taught them that beauty goes far deeper than what meets the eye. I want them to remember the dance parties in the kitchen that were some of the most fun times they had, even if their Mommy was in comfy clothes, with a messy bun on her head and no make-up on. So I smiled, kissed my daughter's nose, and knew the simple question I had for her. "So Mommy, why don't you?" I looked her straight in the eyes and said, "Well, Mommy really didn't think I needed it today. What do you think?" With that, my daughter smiled, wrapped her arms around my waist and confidently replied, "Nope. I think you look pretty just the way you are."